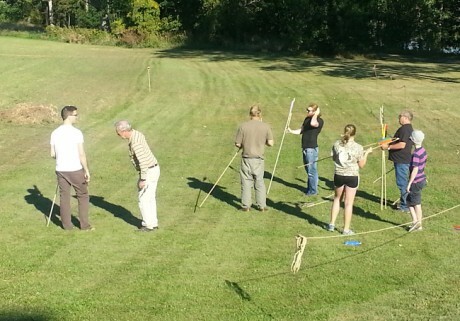 Come to Vermont, enjoy the beauty of the fall in New England and build your own atlatl and darts! Bob Berg of Thunderbird Atlatl will offer our annual Atlatl Workshop at the Chimney Point Historic Site. September 18 from noon to 5 p.m. The program is hosted by the Vermont State Historic site. The Chimney Point State Historic Site borders Lake Champlain at 7305 Vt Route 125, West Addison, Vermont. 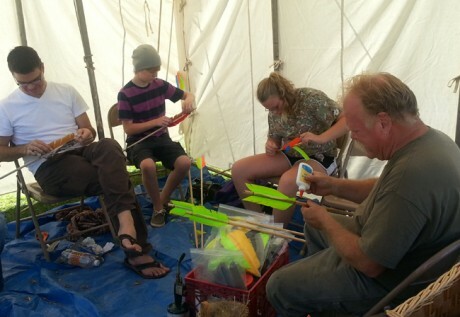 Bob will teach traditional and modern techniques of atlatl and dart construction, flint knapping, hafting stone points, and cordage making. Enjoy atlatl lore and coaching on the use of your new atlatl. Bob’s been here each of the 20 years of this event! $65 includes instruction and materials. Pre-registration required. Call 802-759-2412 to register. After making your own atlatl and darts, consider competing in the annual atlatl competition the next day! The museum opens at 9:30 a.m. From 10 a.m. to 4 p.m. there will be ancient craft demonstartions on the museum lawn and porch. Bob and Cheryll Berg, hafting points and atlatl-making; Charlie Paquin, Woodland pottery (hands-on! ), and Barry Keegan, flint-knapping. 11:00-12:00 Master coaching: Try the atlatl with expert guidance. Look for signs in competition area. 11:30 Food and snacks on & near Museum porch while it lasts. 12:30 Celebratory Flight: Join the mass spear throw to commemorate our 2Oth year! After awards 20th Anniversary Celebration: Enjoy cake & ice cream!